I went out to buy meat and came home with fish. The displays in the shops and markets have a huge effect on my shopping, often even more than my shopping list! A very fresh looking sole from the Atlantic caught my attention and I changed my mind, we’ll have fish on the table instead! 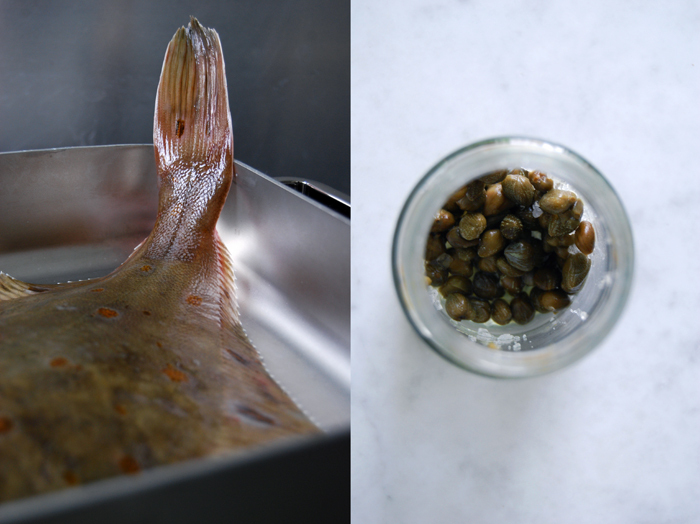 Sole caught in spring, in May and June is supposed to be the best, its taste is finer than during the rest of the year. This one is my first in 2014 and I gave it a Mediterranean twist. Tomatoes, black olives, capers, basil, garlic and a little freshly squeezed orange juice, these are the ingredients for my Mediterranean sauce, a thick and fruity tomato confit. To fry a whole fish can be a bit intimidating, especially when it’s as big as my sole, 650g (1.5 pounds) can be fiddly to flip around. I have a non-stick fish frying pan, a very convenient gift from my mother, which makes it much easier as its shape allows the fish to cook evenly. As long as your frying pan is big enough any other shape will do as well, I prefer non-stick as it needs less fat. My sole is cooked whole, à la meunière coated in a thin layer of seasoned flour. The flour gave the recipe its name, meunière means miller’s wife in French. I sautée the fish on high temperature in lots of olive oil and butter for just 3 minutes on each side. To prevent the fish from sticking to the bottom I shake the pan several times. 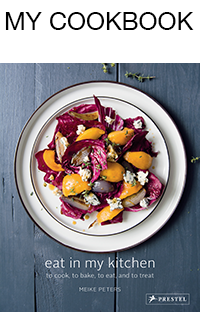 There’s a point of excitement involved in this recipe, and that’s turning the fish. You should always do it quick and with confidence, I did it with my fingers pulling the fish up from its fin. Some use 2 spatulas or even another pan which I think is not necessary, just be brave and it will work! For the tomato confit, heat a splash of olive oil in a sauce pan on a medium heat and cook the tomatoes and garlic for 2 minutes. Add the olives, capers, Balsamico vinegar, orange juice, salt and pepper and cook for 5 minutes (open) or until thick and soft. Season with vinegar, orange juice, salt and pepper to taste. 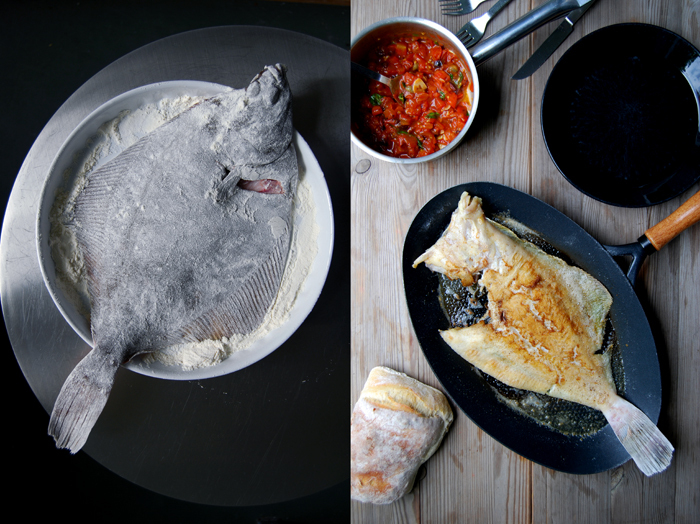 On a large plate, season the flour with a little salt and pepper, toss the fish in, dust on both sides and shake off any excess. 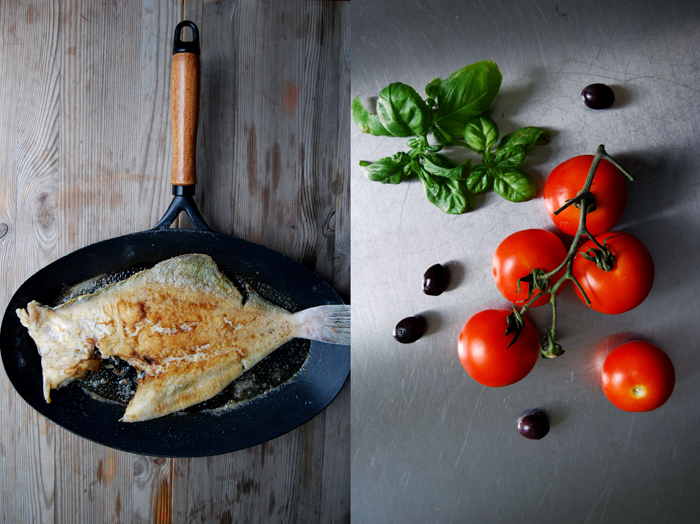 In a large frying pan, heat a splash of olive oil and the butter on a high temperature and cook the fish for 3 minutes, shaking the pan 3-4 times. I cooked the white side first, some prefer to start with the dark side. Turn the fish with 1-2 spatulas (or from the fin like I did) and cook for 3 minutes on the other side until golden. If your fish is much smaller fry it for 2 minutes on each side only. Serve immediately. 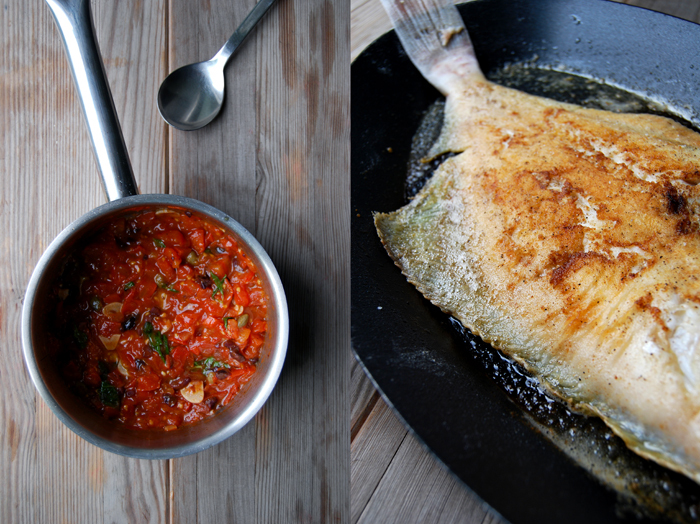 I could eat fish every day of the week…your sole looks sooooo good!